I sync therefore I am. I use a MacBook Pro. Which I like. A lot. Documents, presentations, etc. are saved to a well-ordered Dropbox folder (automatically syncs with my Windows machine at work and my iPhone). I’ve gone with the 50GB for $9.99/month option. Spotify provides all of my music. This is £9.99/month and, to my mind, worth every penny. I sync offline playlists to my iPhone via wifi but can access almost anything I want over 3G. As Evernote recognises text in images and allows you to search through notes, I’m now using it to ‘take notes’ in books I read for my thesis and pleasure. I currently doing ‘pay as you go’ to upgrade storage as and when I need it through the iPhone app (£2.99/month). At the moment that seems to be most months! It was time for the annual pilgrimage to the inlaws who live in Devon. We fly the rest of the time (Newcastle –> Exeter) but once a year we go down for a bit longer with the car. This time, instead of doing the 6 hours or so in one day, we stopped off in Doncaster and then again at a National Trust property. It made for an enjoyable journey! I’ve decided that listening to music mainly by album on Spotify is slightly anachronistic. So I’ve been reorganizing my playlists into ‘Running’, ‘Train’, ‘Deadline’, ‘Working’, etc. I’ve kept the album-focused playlists for the moment, but situational playlists seem to be the way forward! What (if anything) do I want to do with my Ed.D. when I finish it? Is Northumberland where should we bring up Ben and his sister (when she’s born)? Do I want to stay in the FE/HE sector, move back into schools or do something entirely different? As you can see from the above visualization of my Last.fm history I’ve been using it for a fair while (since 19 March 2003 according to my profile). Recently, as I’ve gone Spotify-only, everything that I listen to is ‘scrobbled’ to Last.fm. Which makes the data from the latter part of 2009 onwards much more representative of my listening habits. My favourite music of the ‘noughties’. You can listen to all of the music I mention below through this Spotify playlist! So 2000-2009, commonly referred sniggeringly as the ‘noughties’, has come and gone – and with it the majority of my twenties. For all of it I listened to what I would deem quality music, and for a good deal of it used Last.fm to track what I listened to (and make recommendations). 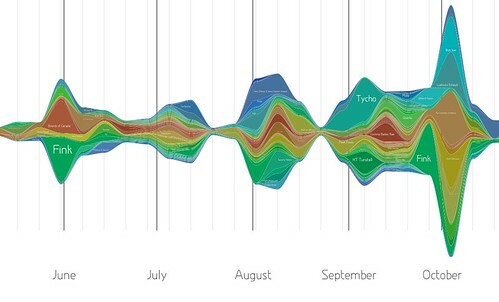 The visualization above shows my listening habits for part of 2009, courtesy of LastGraph. I remember being in Café Rouge in York with Hannah when we heard this for the first time. It must have been 2003 as we were just married. We asked the waiter which album was playing and he replied it was John Mayer’s Room For Squares. I went home and immediately bought the CD. Annoyingly, however, it’s the only album of Mayer’s that isn’t available on Spotify (which I now use instead of CDs and MP3s). When this came out I was working at HMV in Meadowhall, Sheffield. The Cinematic Orchestra produce that sound that’s all encompassing and envelops you. I absolutely adore, for example, the soundtrack to the film The Crimson Wing: Mystery of the Flamingos they did recently. The first three-and-a-half minutes is Cinematic Orchestra at the top of the game. Then Roots Manuva’s rhyming kicks in. Like the rest of the known world, I found Bon Iver’s album For Emma, Forever Ago to be beautiful and with an engaging backstory. However, it was when I started using Spotify that I came across the excellent EP Blood Bank – containing the sublime Woods. It’s rare for a track to be perfectly matched in sound, concept, and execution, but that’s exactly what we find here. Although you wouldn’t know it from the above, my tastes are fairly eclectic. I’m as likely to listen to The Prodigy as I am to some Ludovico Einaudi. But the above are those I come back to time and again. I’ll no doubt have made some glaring omissions – if so I’ll come back and edit this. Hope you enjoy the above songs as much as I do! After my week of divesting the only CDs that aren’t in boxes ready to be sent off to Music Magpie or Amazon customers are those (nine) that I’ve decided to keep as artwork. ** I signed up for a Spotify Premium account the day after their iPhone app became available. It costs £9.99 per month to upgrade from the Free account. For that you get, amongst other things, the usage of their iPhone app (which doesn’t work with a Free account), a higher streaming bitrate and no advertisements. That’s not to say that Spotify features every album and every piece of music that I’ve ever listened to. But I reckon that they’ve got about 90% of the stuff I search for. That’s good enough for me, especially given my eclectic, ever-changing taste in music and the fact they add thousands more track to their library every week – check out their blog! Of course, there are times when your internet connection isn’t so good (or even non-existent). It’s for these times that Spotify has made playlists that you create available offline. Up to 3,333 tracks can be cached for offline play at any one time. That’s certainly enough for me! Finally, then, there’s the problem of making Spotify’s vast library user-friendly. A start has been made via SpotifiTunes (see my library here) which takes your iTunes XML file and creates a list of Spotify links. Wanting an up-to-date version of this, I’ve created a workspace on my wiki dedicated to this. To access this, click on the ‘Music’ link at the top of this blog or click here!